Like Western astrology, Chinese astrology also uses an intricate system of compatibility. 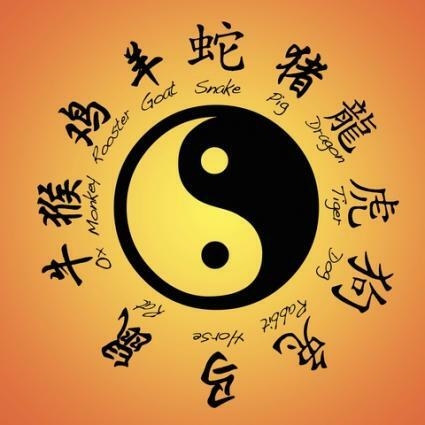 The twelve Chinese zodiac signs are individualized, but a common intellectual and character-shaping energy flows within certain groups of these signs. Since the Chinese culture places great importance upon a close family structure, astrology can be used to explain some of the nuances and complications that occur in family life. Western astrology uses a scheme of four elements to divide up its twelve zodiac signs, and the Chinese system is similar in this respect. The trios of signs within each group are believed to share a common energy, similar to the elemental energies that permeate Western astrology. This shared energy can influence everything from temperament, to the focus on intellect over intuition, or pragmatism over the theoretical. I. Rat, Dragon, Monkey Cunning, intelligent and active signs. Enterprising and ambitious. II. Snake, Ox, Rooster Profound and wary of the superficial. Highly observant and diligent in their efforts. III. Dog, Tiger, Horse Fiercely independent and leadership-oriented. Ego-driven and gregarious. IV. Rabbit, Goat (Sheep), Pig Peace-loving, intuitive and empathetic. Nurturing and cooperative. The principles of astrological compatibility are not restricted to intimate and sexual relationships. Compatibility measures the effect one sign has on another regardless of the relationship's nature. Hence, the signs which serve you best in an intimate setting may also provide the base for stable families and businesses. Likewise, as families must overcome strife or simple disagreements within themselves, competing energies within the Chinese zodiac can often explain these grievances. It's easy to see how family dynamics can break down on numerous levels. Of these three levels, the most important compatibility issues will occur between the husband and wife. The marital relationship is often a great indicator as to how siblings will react to one another, and it can also inspire happiness or devastation between parent and child. This is not to say that in-laws and extended relatives are not also affected by the rules of family compatibility. In some cases, in-laws can also inject a heap of wealth or tragedy into the nuclear family. Though the above chart emphasizes the importance of the zodiac groups, the actual size of the twelve zodiac animals can have a profound influence on interaction. Large animals: Ox, Tiger, Dragon, Horse. Small animals: Rat, Rabbit, Snake, Goat (Sheep), Monkey, Rooster, Dog, Pig. It's a common response for individuals within the smaller animal signs to naturally succumb to the larger animal signs. However, such behavior tends to breed resentment over time. The general consensus within Chinese astrology is that it is more favorable for the larger animal signs to restrict their dominant energy and give in to the smaller signs. This displays respect and consideration for the disadvantaged and, in turn, helps to form solid and lasting relationships. Even families built from the most harmonious energies can still quarrel and split due to harsh environmental influences. Every sign within the Chinese zodiac has its own potential negative characteristics, which can be cultivated into dominance by a poor upbringing and traumatic events. In contrast, signs that compete or clash in a family environment may be brought into submission or peace by simply reigning in any intolerant or negative behaviors. Essentially, the compatibility of a family can be as greatly influenced by its astrological makeup as by its learned behaviors and responses. For this reason, it is vital for every zodiac animal to work toward achieving his personal balance, which, in turn, will ultimately affect the balance of his family and community.